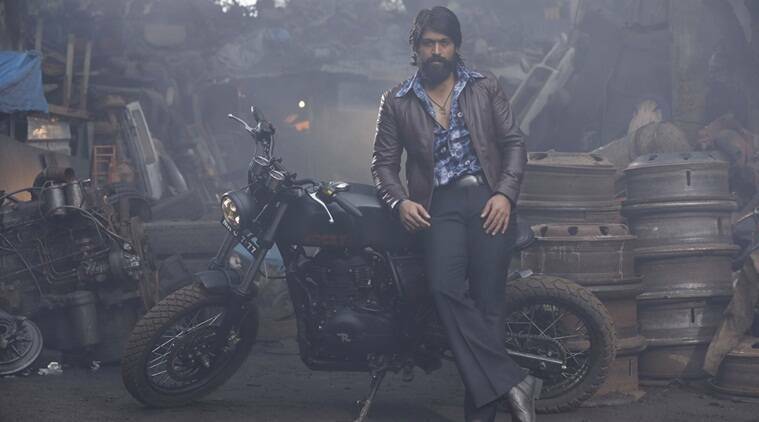 KGF movie review: The impressively-mounted sets make up for Prashanth Neel's flimsy storyline. Composer Ravi Basrur lifts up the scenes with his terrific background orchestra. KGF movie review: KGF could have been a very different experience with sharp and tight editing. KGF: Chapter 1 opens with India’s woman prime minister signing an order to end the reign of the country’s most dreaded criminal. Of course, it’s Rocky (Yash). The lord of the criminal world had a very humble beginning. He was raised in Mysore by a single mother, who died due to poverty when he was still young. Before bidding adieu, she gives the protagonist a goal to chase: get rich by any means necessary. A madman on streets tells the impressionable boy the means to achieve his goal: become powerful. The boy takes the train to the city of dreams. He makes a living by polishing boots in 1960s Bombay. He soon makes a name for himself after he breaks two beer bottles on the bald head of a cop. The word about the new ambitious kid in town reaches all corners of the city. He names himself Rocky as it is short and easy to remember for others. Rocky jumps at the offer. He goes to Bangalore and literally stumbles on gold. Now, his thirst for power and wealth grows deeper and even volunteers to enter a hellhole to dethrone the satan himself. When the story moves out of Bombay, the narration begins to lose steam. It is as if director Prashanth Neel, who is also the writer of the film, was saving the remaining best bits for the second part. After a point, he drives the film on an empty tank. We learn about Rocky’s battle exploits through the words of a veteran journalist, played by Anath Nag. And later Prashanth adds two more narrators within the narration of Anath Nag to build the legend of Rocky. The film works like folklore, which you tell mere mortals like the office assistant in the film, who gets engrossed in the story that he forgets about constant bullying he faces at the workplace. It is this escapist entertainment, Prashanth has committed himself to achieve and he has delivered in that respect. He keeps churning out one cinematically memorable moment after another but without any emotional depth. He has even drawn inspiration from SS Rajamouli’s Baahubali films. We get a scene where Garuda, one of the several antagonists, unveils a statue of himself. With camera panning up showing the towering statue over Garuda’s mortal frame reminds us of the iconic interval block from Baahubali: The Beginning. And in another scene, Rocky single-handedly pulls a cart full of food supplies as others standby and watch it in awe, just like the scene when Baahubali alone pulls the giant statue of Bhallaladeva. Prashanth was so occupied with pandering to Yash’s stardom, that he has underwritten Srinidhi Shetty’s character. While usually the female leads don’t get much to do in hero driven films, at least they are given expensive songs to perform. But, Prashanth has denied even that to Srinidhi as he has concentrated all his might and resources to building the myth around Rocky. The impressively-mounted sets make up for Prashanth’s flimsy storyline. Composer Ravi Basrur lifts up the scenes with his terrific background orchestra. We know it is not easy for filmmakers to kill their darlings and especially ones that were shot on the expensive sets of a gold mine. But, sometimes, they have to make some hard choices to enrich their work. KGF could have been a very different experience with sharp and tight editing.